This product from ChessBaron: Free Shipping for UK. 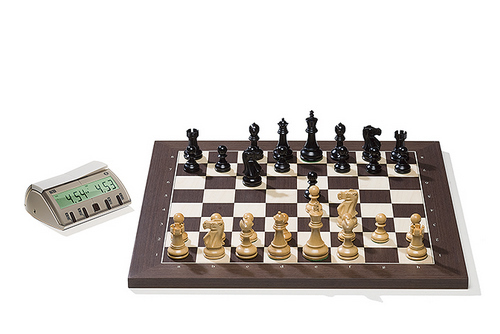 New generation of DGT technology with Classic Chess Pieces. Each piece is equipped with an RFID (a means of the piece telling the computer which piece it is and where it is on the board). For use with all the top Chessbase engines and any extra installed engine: FRITZ, JUNIOR, SHREDDER, HIARCS, ZAPPA, TIGER, or a UCI engine running within a ChessBase interface. The beautiful classic wooden DGT e-board easily connects to the serial port on your PC. Make your moves on the DGT board, the voice on your PC will call out its replies (or you may prefer to refer to the PC screen). Or, the move is displayed on the XL Clock, so you don't even have to able to to see or hear the PC or MAC. The unit has automatic and instant piece recognition. It's perfect for all types of use including serious games (because you're playing on a proper board), and works very well for Blitz or working through specific games. The giftbox comes with a special edition of the famous Fritz program and 100 days free access to PlayChess.com.Ideal for setting up positions, inputting of games and for analysis. Automatically store games in the memory of the board while you play, and retrieve the games as PGN later. Dimensions 480 x 480mm. Squares 55 x 55mm; king height 95mm. Compatible with all Windows and Apple Operating Systems. Includes Serial Connection Kit. Because we know you care - we care, Buy peace of mind. Buy ChessBaron. SERIAL PORT VERSION, Wenge Board, Classic Design Pieces.